In my opinion, there are 5 winter jackets everyone should own to make dressing up during the cold months a bit easier. From the trusty parka to the glam-looking faux fur jacket, scroll down to read about the five styles you should have in your closet to get all the different winter occasions covered! 1. The Classic Parka: There’s nothing like owning that perfect winter parka that you can always count one no matter how cold it gets outside. If there’s one jacket you should definitely consider splurging and investing in, is this one. I bought the Community Paradigm Parka and I love how warm it keeps me (I believe it’s on sale right now) but other great parkas out there include this one, this one, this one and this one. 2. 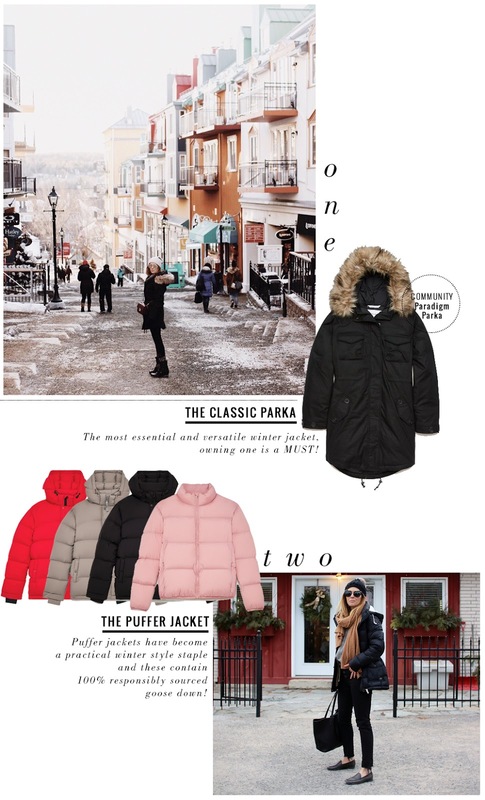 The Puffer Jacket: Puffer jackets have been gaining lots of popularity, in particular big and very puffy versions. I love their sporty look and how great they are for low key days of exploring or when you’re out and about doing winter activities. Just remember that since they are big in style, it’s best to keep the your bottom half on the slim side to balance out the proportions (think of skinny jeans and leggings). I absolutely love the The Super Puff from TNA and the Park City Puffer from Babaton. More options to consider if you’re on the lookout for one include: this one (just $40! ), this one, this one, and this one. 3. The Classic Wool Coat: A classic black wool coat is definitely a closet staple and one of the top winter jackets one should own. It’s perfect for wearing during the day and night and can easily take you from the office to evening events while not compromising your style. Pictured above is the Wilfred Cocoon Coat but if you’re looking for more options, I recommend this one, this one, this one and this one. 4. 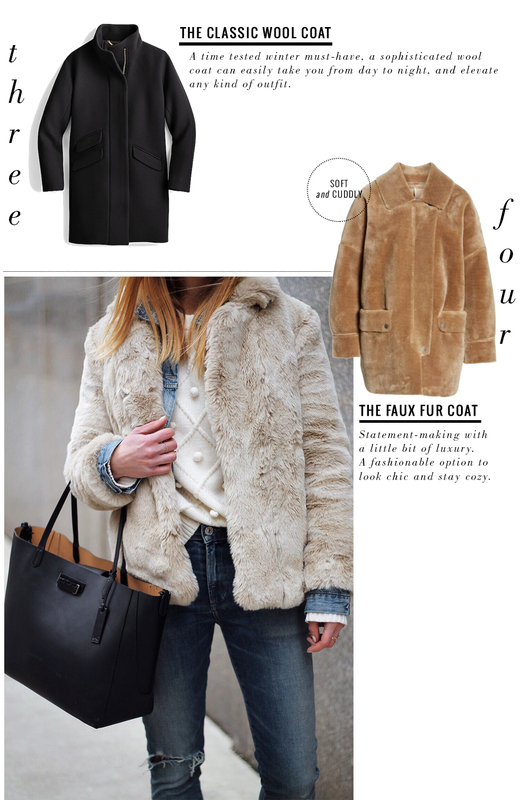 The Faux Fur Jacket: Faux fur jackets are perfect for dressing up any kind of outfit and adding that bit of luxury that sometimes is necessary. I recently got this one (in lavender) and absolutely love it (it’s incredibly soft and cuddly) and also love this one, this one and this one. 5. 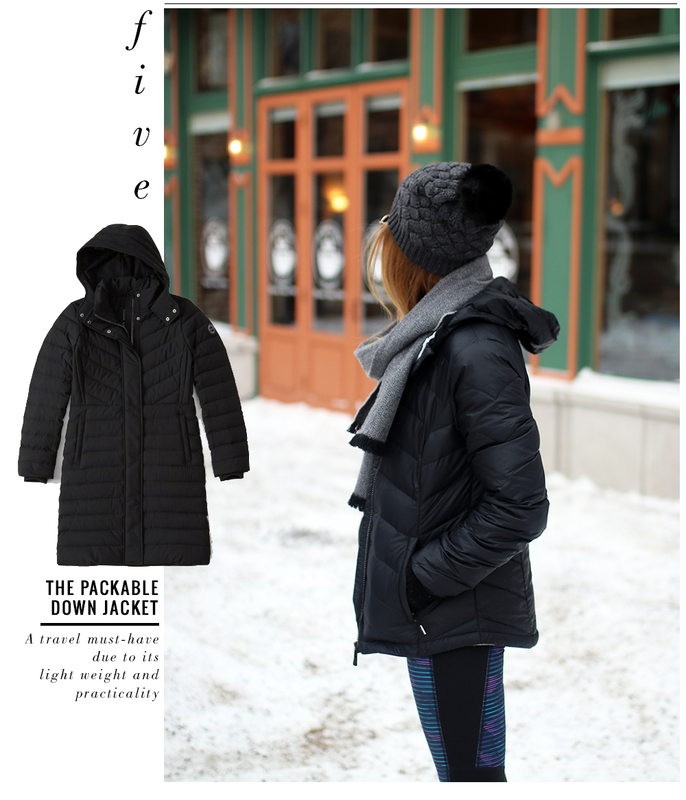 The Packable Down Jacket: A travel must have because it’s lightweight, easy to fold and bring along in your suitcase, carry-on, weekender or backpack. I got this one from Lole at the beginning of the year and it has become such a practical piece! Some other options to consider include this one from Uniqlo (in my opinion, they make great basics and winter layers ), this one (also from Lole and on sale), this one from Patagonia (they make AMAZING jackets) and this one (another amazing brand that knows what they’re doing).